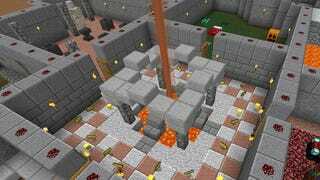 This is the Dungeon Heart and the treasury from a Minecraft recreation of a whole Dungeon Keeper 2 map. It was built by YouTuber spumwack in survival mode, which means he gathered all the materials by hand. Nicely done! There's many more (annotated) shots in the Imgur album below, showing off the various rooms.